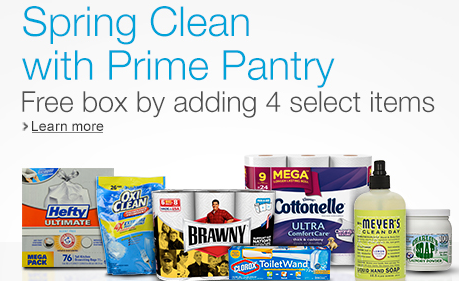 For a limited time, you can select (4) Spring Cleaning items in your Prime Pantry Box and it will ship for FREE (regularly $5.99). Brands to choose from include Mrs. Meyers, Kleenex, Finish, Hefty, Quilted Northern and more. If you have the $5.99 No Rush Credit in your account from the previous promotion, you can use the credit on this order too! If you’re not familiar with Prime Pantry, it’s a service offered by Amazon that allows you to choose everyday essentials to come in everyday sizes in one box to your front door!